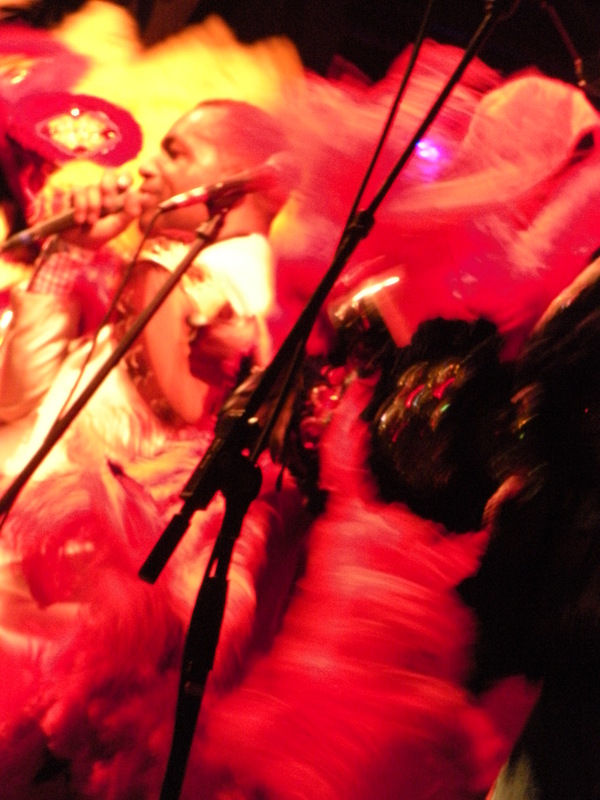 When we’re all gone, Davis, Treme will remain and all this will not be forgotten. Je me souviens. Sorry, I had a conflict last night and haven’t seen the episode yet, so no clever headline. It’s an open thread, kids. I’m still in GO buffer Hell. (‘Cause he is a suckubutt). 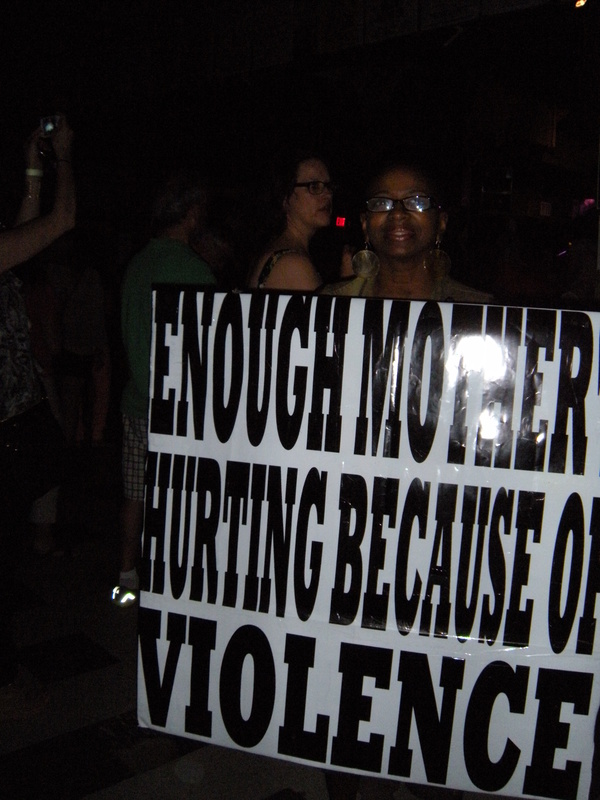 As most of you have probably heard, there was a mass shooting at a Second Line on Mother’s Day. Nineteen people (actually the number is 21 if you count injuries from being stampeded) were injured. We count our blessings that none were killed. 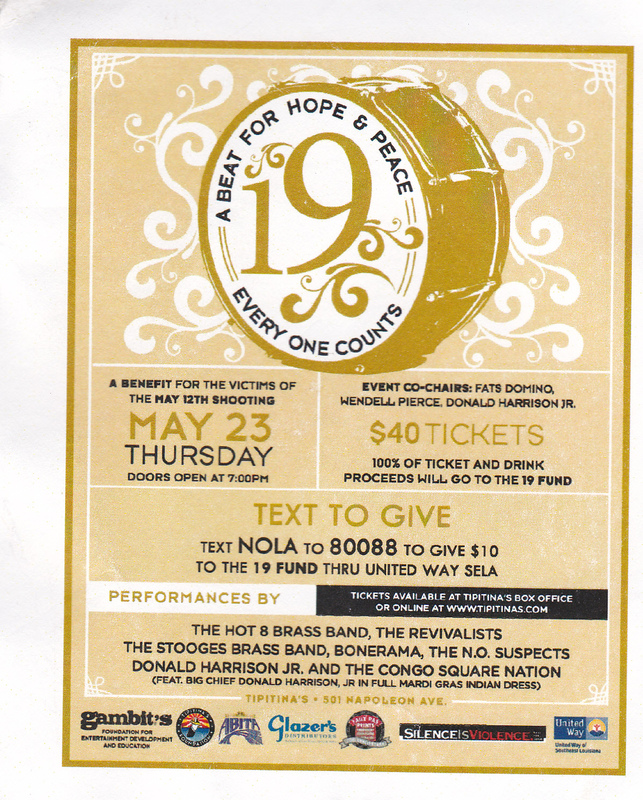 Gambit, Tipitina’s, Silence is Violence, and the United Way, among others has put together a fund to help those victims. Many will incur massive hospital bills, need counselling or just basic living expenses while they heal. (I also heard that our beloved TBC-To Be Continued Brass Band, has lost their instruments. 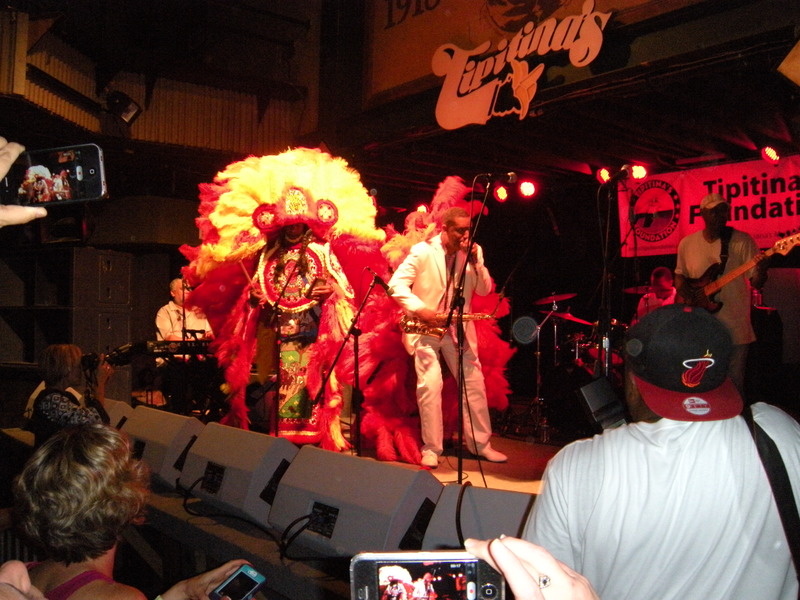 They were playing the second line, put them down to go help people, and the instruments were run over. I’m trying to get info from them on what they need. There was a great benefit concert Thursday night that I was privileged to attend. I got there a bit late so missed most of the Hot 8 but got there in time to hear the Stooges rock the rafters. She disappeared before I could get her name. 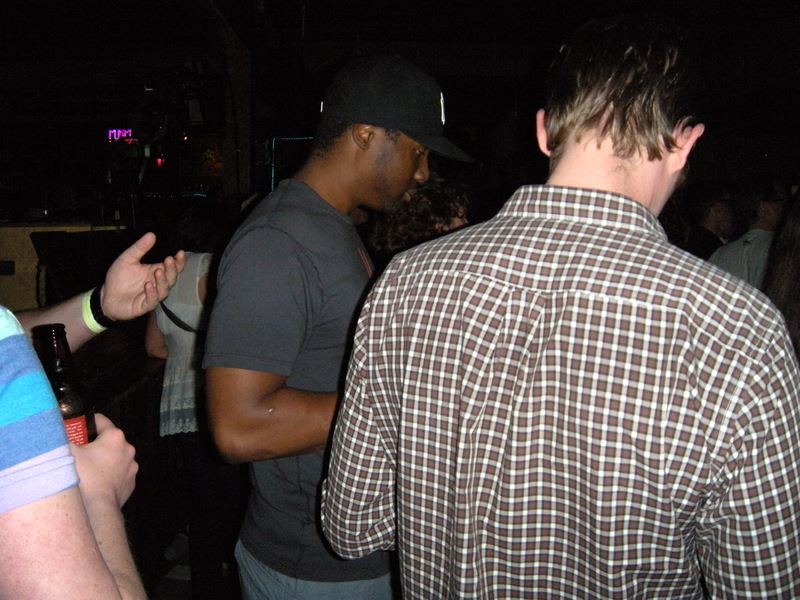 Then I looked over to my left and a tall good looking guy with a Yankees cap was standing there with some friends. 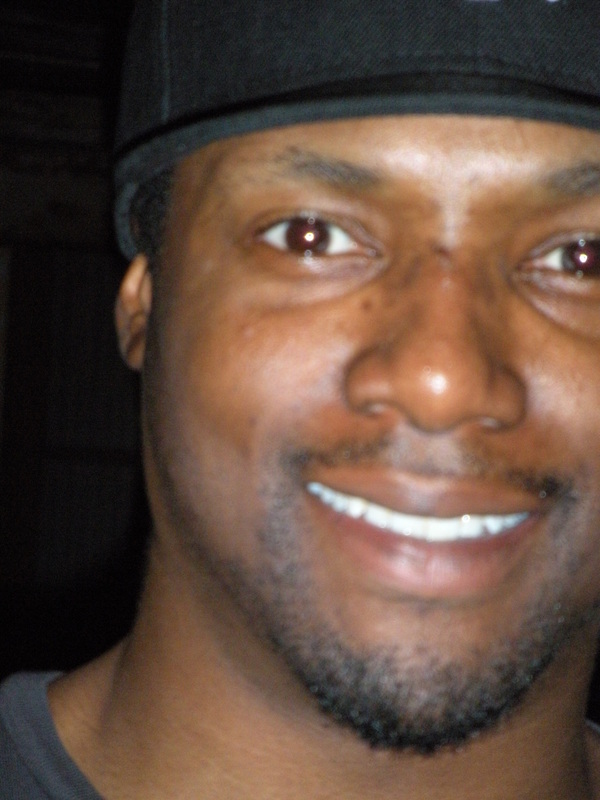 It was Rob Brown, better known to you readers as Delmond Lambreaux. When the folks I was with offered to buy him the drink he was ordering, he refused saying, “Remember the cause!” He was right. 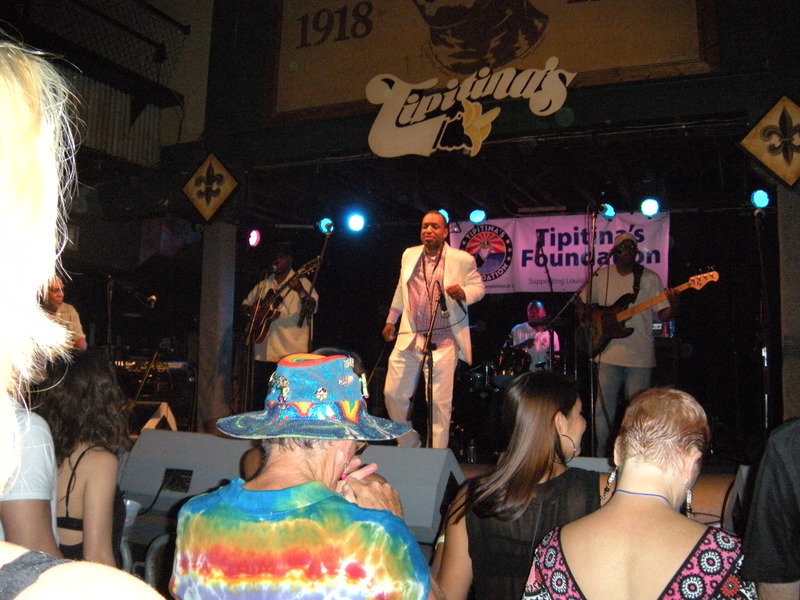 Tipitina’s gave every dime from the bar to the fund, and every dime of every ticket went to the fund. The generosity of this city continues to amaze me. Later I caught him with a quick shot, a bit out of focus but a big smile. I told him about all of you having lots to say about his character on the show. The music just kept going and I started dancing instead of taking pics. 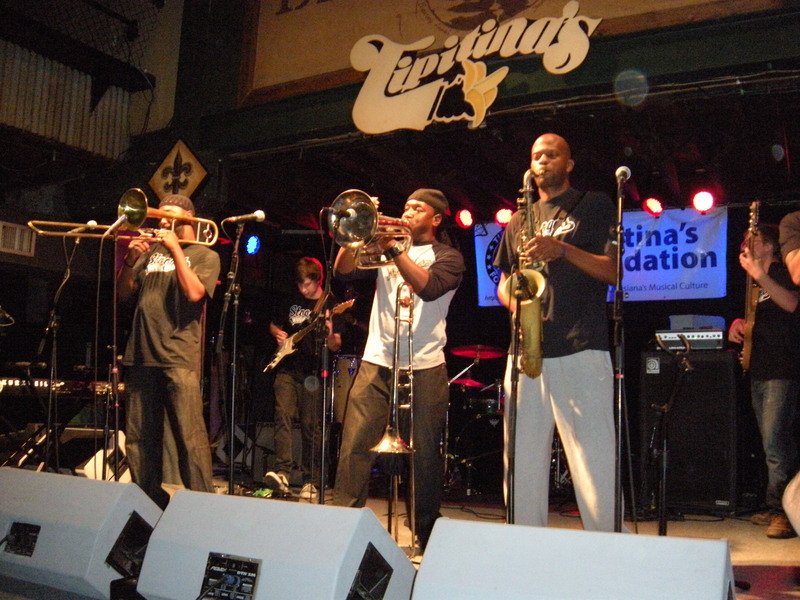 Bonerama, The N.O. 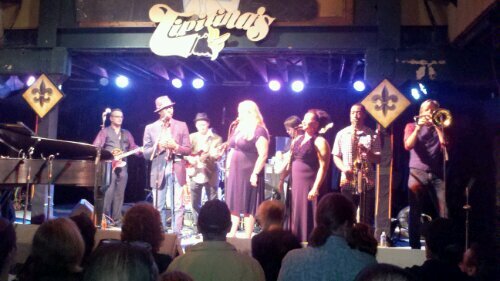 Suspects (with Bonerama bones in there with them too), were wonderful. Then out came Donald Harrison, Jr. 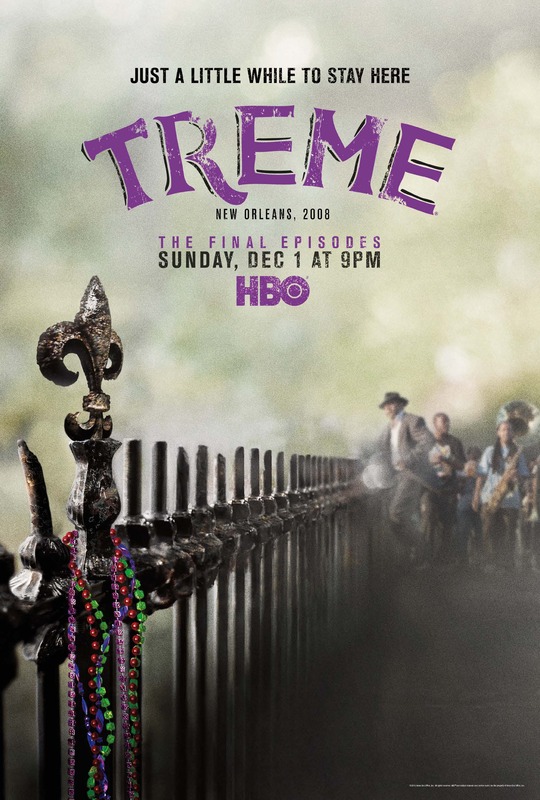 Rob Brown was ordering a drink for a friend and I laughed telling him that the most surreal scene in Treme for me was watching him trying to convince Donald Harrison that his character, Delmond, should make an album that Donald Harrison had already made in real life. He looked at me and said, “Yeah, it was surreal and that was the idea!” although he seemed surprised a bit that some of us viewers had noticed. When Donald Harrison, Jr. came out on that stage in his white suit, suddenly it was old school R&B at it’s best. It started out hot and just got hotter. Then he started chanting and calling Indians. They came on one by one. I got a few pics but was mesmerized by the music. They came on one at a time, with him standing in front of those already there. Then the roof started being raised. It was a musical prayer of sorrow and healing and pure flat out joy. Bartenders were jumping up and down. No one in the crowd was standing still. The colors swirled and Harrison and the others sang and chanted and transported us all. 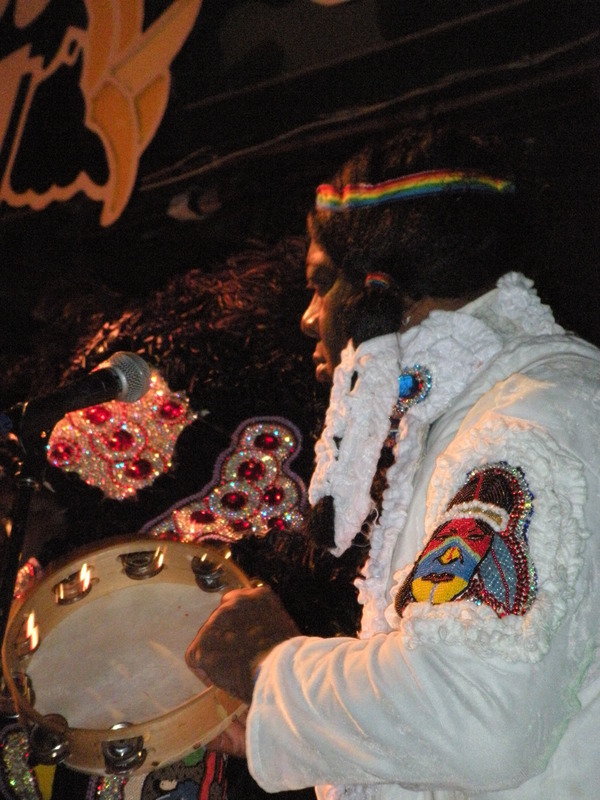 He was surrounded by feathers and patches and beads and sound. It really was one of those moments that makes me glad to have been alive in that place at that time to see those flying colors and hear those sounds that didn’t seem to fly off into space, but found a place in your feet and belly making the notes feel like you could hold them hard in your hand. Yeah. I guess you can tell I was bowled over. Then Wendell Pierce came on to remind us all about continuing to donate, as this fund is an ongoing thing and then he quickly left the stage to the Revivalists who closed out the show and kept everyone dancing. At least those who could still stand. I got jostled a bit so forgive the lack of good focus on Mr. Pierce. I don’t think he’d mind though. 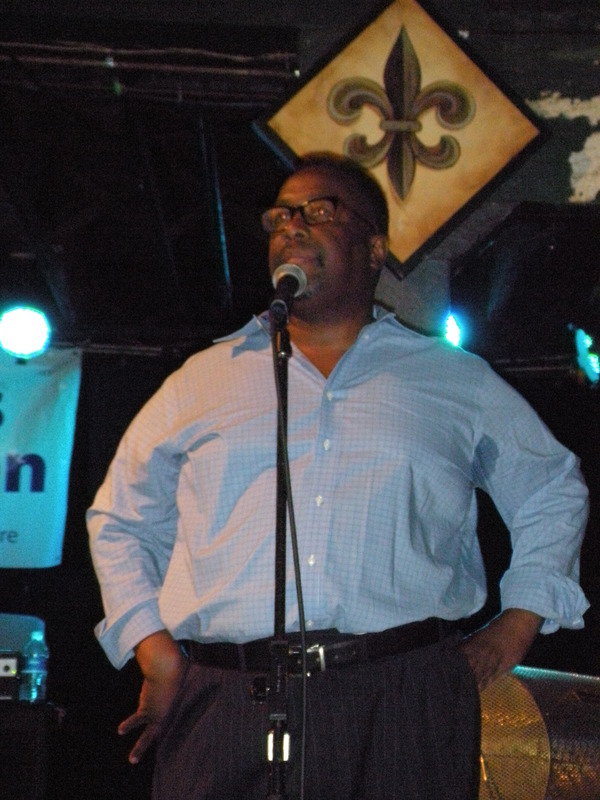 He was one of the co-chairs of the event along with Donald Harrison, Jr. and Fats Domino. I have no doubt that he’d think the continued donations to the fund are more important than whether or not the photo is in focus. If you feel moved to help out, and I hope you do, please head to http://www.unitedwaysela.org/19fund/ It will be very much appreciated.